The Rev. 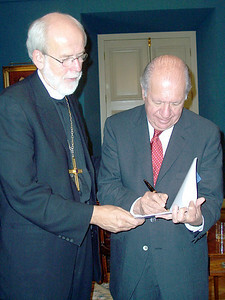 Mark S. Hanson (right), LWF president and ELCA presiding bishop, met with Ricardo Lagos Escobar, president of Chile, Oct. 17, 2005. The Rev. Mark S. Hanson (far left), LWF president and ELCA presiding bishop, his wife, Ione Hanson, and the Rev. 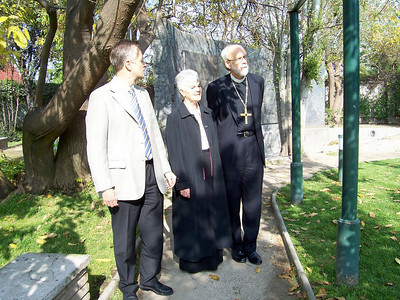 Martin Junge (right), LWF area secretary for Latin America and Caribbean, visit "El Parque por la Paz Villa Grimaldi" in Chile. 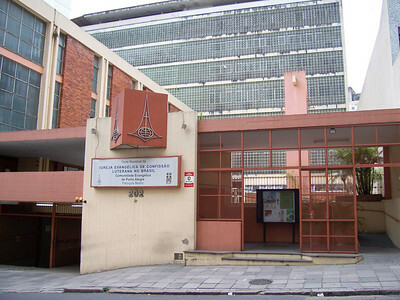 The churchwide office of Igreja Evangélica de Confissão Luterana no Brasil (Evangelical Church of the Lutheran Confession in Brazil), Sao Paulo, Brazil. The Rev. 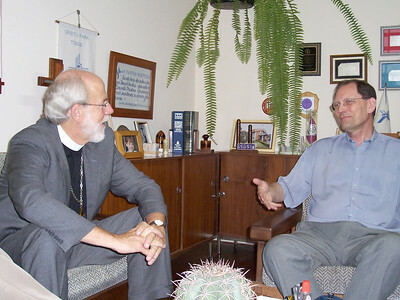 Mark S. Hanson (left), LWF president and ELCA presiding bishop, and met Oct. 12 with the Rev. 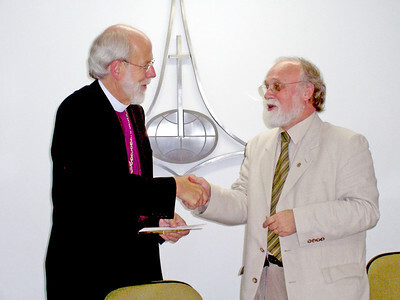 Walter Altmann, pastor president, Igreja Evangélica de Confissão Luterana no Brasil (Evangelical Church of the Lutheran Confession in Brazil), Sao Paulo, Brazil. The Rev. James K. Echols (right), president of the Lutheran School of Theology at Chicago, presents a plaque to the Rev. 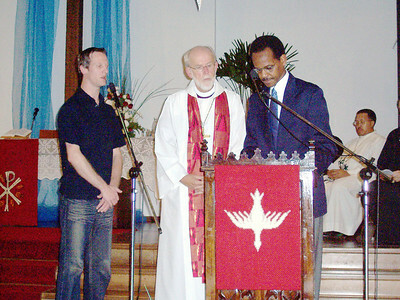 Mark S. Hanson (middle), LWF president and ELCA presiding bishop, Oct. 13 memorializing the Rev. Will Herzfeld, the first African American to serve as presiding bishop of a Lutheran Church. The Rev. 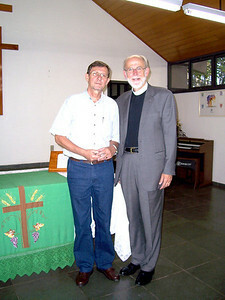 Helmar Reinhard Roelke (right), synod pastor, Sinodo Espirito Santo a Belém, Vitoria, Brazil, and met Oct. 10 with the Rev. Mark S. Hanson, LWF president and ELCA presiding bishop. The Rev. Mark S. Hanson (left), LWF president and ELCA presiding bishop, met Oct. 13 with the Rev. Carlos Walter Winterle, president of the Igreja Evangélica Luterana do Brasil (Evangelical Lutheran Church of Brazil) -- a fellowship of the Lutheran Church-Missouri Synod.